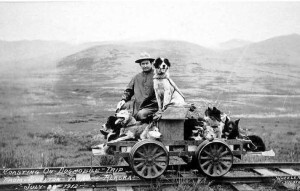 Walter W. Johnson on a dogmobile trip from Shelton to Nome Alaska, 1912. UAF-1980-68-243, John Zug Photo Album, University of Alaska Fairbanks Archives. The Archives of the Alaska Historical Society are housed in the Archives and Special Collections Department, University of Alaska Anchorage/Alaska Pacific University Consortium Library. The AHS Archive includes material about the history of the organization, as well as a variety of material related to the general history of Alaska. For example: photographs from Alaska trips by F. W. A. Poppe, John T. Smith, and Archie Templeton; original and copied papers of Alfred P. Swineford, an early governor of Alaska; and photographic materials by or relating to C. E. Claypool, Ida Copley, Courait, J. Ferguson, C. Gilpatrick, the Kalifornsky Family, Loman and Hanford, the McKeown Family, Ann and Robert Mounteer, Otto Schallerer, and C. M. Thurston. There are also groupings of miscellaneous original and copied photographs, clippings, and publications. The AHS Archive is available to the public for research purposes. Anchorage, AK 99508 (907) 786-1849, http://consortiumlibrary.org/archives.